A Maurice Wilkins Centre collaboration across several scientific disciplines has led to a patent for a new immunotherapy drug. Maurice Wilkins Centre investigators have been collaborating to target a molecule on immune cells ("CSF1R") that can slow down the immune system's attack on cancer. "The immune system's response against a tumour involves complex interactions between many different immune cells," explains Professor Peter Shepherd, Deputy Director of the Maurice Wilkins Centre. While white blood cells called T cells can attack and kill cancer cells, says Peter, a second type of white blood cells called macrophages can slow the T cells down. "CSF1R is a receptor located on the surface of macrophages, and it's crucial to the development and function of macrophages. By inhibiting CSF1R, we can stop the macrophages in tumours from blocking the T cells, thereby enabling T cells to kill the cancer cells." Peter collaborated with chemist Dinstinguished Professor Bill Denny from the Auckland Cancer Society Research Centre, and immunologists Professor Rod Dunbar from the University of Auckland and Professor Ian Hermans from the Malaghan Institute of Medical Research to develop a unique series of chemicals that target CSF1R's enzyme activity. Other Maurice Wilkins Centre investigators involved in the project include Jack Flanaghan, Gordon Rewcastle, Stephen Jamieson and Christina Buchanan. 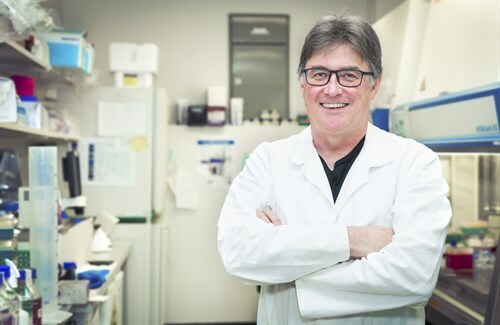 Professor Peter Shepherd (pictured) is collaborating with several Maurice Wilkins Centre investigators on the development of a novel compound for potential use in cancer immunotherapy. Peter says the ability of the Maurice Wilkins Centre to bring together the country's best biomedical scientists has enabled the research to advance rapidly: "The Centre specialises in bringing together powerful teams to tackle major projects, in this case enabling the cancer biologists and chemists to work directly with immunologists." Rod agrees: "To date, much of our immune therapy work has focused on vaccines. It's exiting to see how we can apply New Zealand's small molecule capabilities to help accelerate immune therapy for cancer." The next stage for the researchers is to understand how this new class of drugs perform in animal models of cancer, and how they will affect macrophages in those contexts. From there, the team hopes to find candidates that can go into clincal development. "The Maurice Wilkins Centre has been involved in the development of 'molecularly-targeted' enzyme inhibitors since the mid-1990s, when it was a new paradigm in cancer drug development," says Peter. "Our successful track record of advancing these types of drugs to clinical trials with commercial partners makes this landmark development of CSF1R inhibitors all the more exciting."